When I first used Bite Beauty's creme lipstick, I was transported back to being a very young girl, watching my mother apply a vibrant red to her own pout with care before leaving the house. And I realized how very much lip products and their textures have changed over the years. This is REAL lipstick. It has heft and durability. This is not for the faint of heart, but it certainly can be worn ...read moreby everybody. 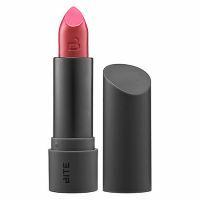 Bite has created a shade for every woman, from natural pink to wine and bold (and very flattering!) brick red. One of the best aspects is that this stays put but also cares for your lips with moisture-rich color. Each lipstick contains the amount of the antioxidant resveratrol found in five glasses of red wine. Organic shea butter, argan oil, and Vitamins E and C work hard to keep your mouth pliable, hydrated, and protect tender skin here against premature aging. While the finish is more matte, or velvety, than you may be used to, it can be a very sophisticated look. In order to make it work for you, exfoliate lips thoroughly with your favorite product--dead skin will ruin the effect. Once lips are flake-free, the most dramatic and precise appearance is achieved with a lipstick brush. Begin at the center of your lips and work outward, very slightly modifying your lip lines if you so desire but not to the extent that it appears unnatural. One hint when working with is lip brush is to be sure to "link" the color at the very corners of your lips; some women leave them bare and the result is an unfinished appearance. Perhaps you want even more drama. With a lipstick brush or your fingers, top lips with a high-shine gloss to have all eyes on you and enjoy the attention! I love this lipstick! They are very moisturizing and the range of colors are fun. Fig, Musk, Pepper, Shiraz, Cin Cin, Pomegranate and Tanin are standouts. The first four are the pinks/neutrals while the last three are bold reds/ corals. This lipstick really is great if you have dry lips. It does last a while, but I did find myself reapplying. It does not really bother me because my lips feel soft even after the product comes off. Really recommend it! These have been my latest lipstick obsession. I originally bought bite when I was in Sephora and wanted to try the purple lip trend but wasn't ready to go full purple. I found the "Spritzer" shade to be a nice light purple. That day I put it on I got lots of compliments. The lipstick comes in bold shades, they are smooth and make your lips feel moisturized. I now have it in a darker shade "Radish"...read more it is a hot pink that says "all eyes on me". I would say that with the stronger colors since it is so highly pigmented, it can get messy. For example if you get out of lines applying it or kiss someone it is definitely going to leave a mark but if your just wearing it for fashion it looks great.